The challenges faced by data technology in industrial applications continue to grow. While 100 Mbit was still seen as a sufficient standard recently, the data protocols are now moving towards 10 Gbit/s. The availability of more data within the shortest time is the goal for the future. Today many connection systems (such as USB, RJ45, M12) have been introduced that satisfy these requirements. But as soon as the requirements placed on the connection systems also extend to mechanical properties, such as installation size, robustness and mating cycles, in addition to the data rates, the known connection systems are no longer adequate. Günter Rohr/ODU Global Portfolio Manager asks, "Can you imagine using an RJ45 connector with a hand-held computer multiple times each day in harsh environments? Probably not, because such a system cannot satisfy the requirements for leak tightness and mating cycles." As a solution, today’s standard connectors are often integrated into larger connector housings. The problem here is that this not infrequently doubles or triples the overall size. 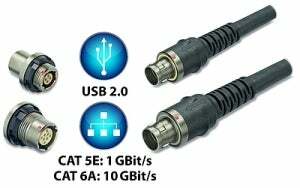 ODU Steckverbindungssysteme develops and constructs the right connectors for exactly these applications, while complying with the standards for data transfer. Different models are available and tested up to 10 GBit/s. ODU-MAC offers the option of combining different interfaces in one modular system. Very frequently a number of connectors are required in order to connect data, signals and power. With our modular ODU-MAC connection system, these interfaces can be combined into one connector. Special modules that guarantee a reliable data transfer have been developed for this purpose. In addition to the merits of the modular configuration, this connection can also be used as an interface in test systems with up to 100,000 mating cycles. The ODU springwire contact technology makes it possible. In addition to the standard connectors, we also offer customers our know-how and competence in data technology for application-specific developments. Understandable, that an interface in the field of rail technology or oil and gas extraction must satisfy completely different requirements. Today ODU is combining its many years of experience in the field of connectors for extreme requirements with data technology requirements. We develop, simulate, test and build the optimal solution for our customers. All necessary prerequisites are met for when "the standard is not enough."